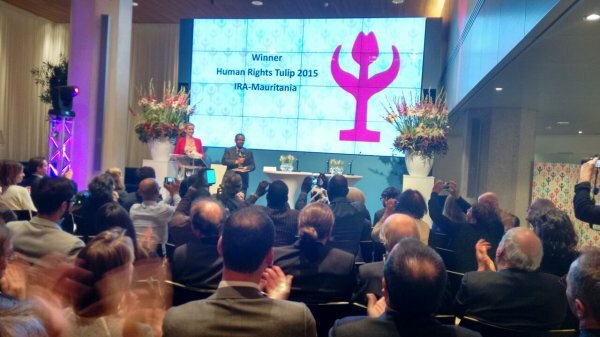 The annual Human Rights Tulip award ceremony was held on 10 December 2015 at the Ministry of Foreign Affairs in The Hague, the Netherlands. It is an annual award for individuals or organisations that promote human rights worldwide in innovative ways. The Tulip, a bronze sculpture, has been awarded to UNPO’s Haratin member IRA-Mauritania for their courageous fight against slavery and discrimination in Mauritania. The award was presented by Dutch Minister of Foreign Affairs, Mr Bert Koenders, and received by the IRA-Mauritania European Coordinator Mr Abidine Merzough. The award is a prestigious token from the Dutch Ministry of Foreign Affairs and it comes with a gift of €100.000. Mauritania criminalised slavery in the landmark 2007 Anti-Slavery Law. In spite of this criminalisation, slavery is still rife and about 20% of Mauritania’s 3.5 million residents are affected by such practices, mostly children from the ages of 8-20 and almost exclusively Haratin. Due to a persistent culture of denial among the ruling elites and authorities any attempts to raise awareness of the practice are stifled. IRA-Mauritania is on the forefront of the human rights struggle to combat this injustice and abolish all forms of slavery, sexual abuse and domestic servitude in Mauritania. The final 5 candidates of 2015 were Phyoe Phyoe Aung (Burma/Myanmar), Maziar Bahari (Iran), Azizullah Royesh (Afghanistan), B’Tselem (Israel) and GENDERDOC-M (Moldova). The jury consisted of Margaret Sekaggya (UN Special Rapporteur on the situation of Human Rights Defenders), Ales Bialiatski (Belarus), Shahzad Ahmad (Pakistan), Professor Nicola Jägers (the Netherlands) and Amira Yahyaoui (Tunisia). The ceremony commenced with a speech from Margaret Sekaggya on the importance and relevance of human rights defenders as well as their protection worldwide. Even though there is an international platform for human rights defenders at the United Nations, Sekaggya emphasized how crucial and special it is for human rights activists to receive recognition of their brave work with an award. Sekaggya’s speech was followed up by Minister Bert Koenders who spoke broadly about interrelated subjects such as the fight against slavery, Dutch colonialism, terrorism and violence against women and children. Finally, Mr Merzough gave his thanks on behalf of IRA-Mauritania for being nominated and selected as the winner. He assured that the organization will use the prize money to ensure efficiency in its activities so to tackle the issues faced by the Haratin as effectively as possible. We congratulate our member IRA-Mauritania for their win and will continue cooperation in their ambitions to end slavery in Mauritania.